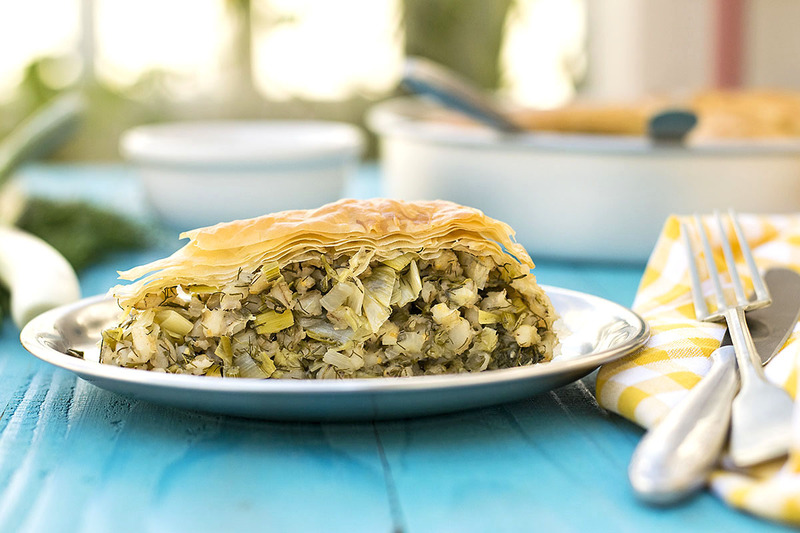 This healthy leek, fennel and barley pie can also be made with wheat berries or rice. And it’s so versatile that can be served as a lunch, side, or dinner. Did you know that barley is actually one of the oldest consumed grains in the world? It is also a big part of the Mediterranean cuisine and especially in Crete, you can find some amazing rusks made from barley flour. 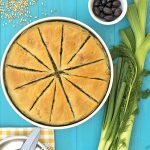 In this healthy, plant-based and vegan pie recipe, barley is used whole, and it is part of the filling which among other things includes a lot of leeks and some fennel fronds and stalks. The crust is made of phyllo dough which gets brushed with olive oil in order to brown beautifully and become extra crispy. Eat this pie for lunch, or serve it during dinner as a side dish (one small piece) or as a main (two pieces should be enough). 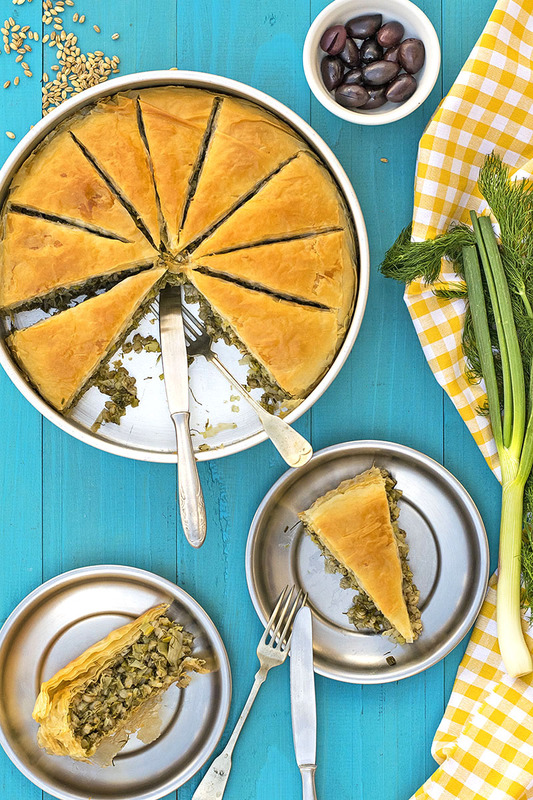 My inspiration for this recipe was the famous Greek Spanakopita (spinach pie) and a simple recipe my mom makes with potatoes, leeks and fennel fronds. 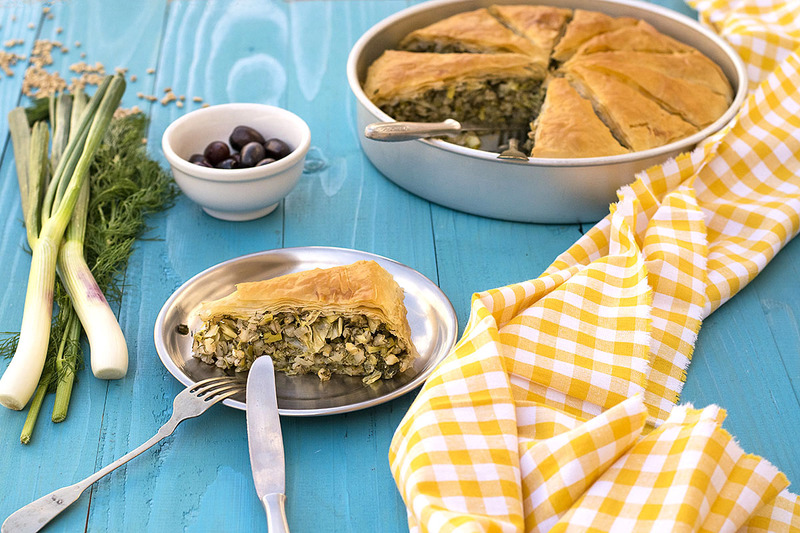 Now, though I don’t have a spanakopita recipe on the blog, I do have an easy skillet chicken a la spanakopita recipe, if you’re interested 🙂 And as for my mom’s recipe, I can tell you about it. It is a simple stew with potatoes, tomato juice, onion, white wine, wild leeks and wild fennel fronds. These greens, which are harvested from the Cretan hilltops are thinner and smaller in size but so much more fragrant! And it may not sounds like much, but once you open the lid of the pot, you can feel all the flavors of the island coming through your nose! Barley is another great ingredient with plenty of fiber, complex carbohydrates, and plant-based protein. You can use whole or pearl barley, though the whole is certainly healthier. Keep in mind that barley is chewier than wheat, so if you think you won’t like it much you can also use wheat berries, bulgur or even rice for this recipe. Wheat berries will require the same preparation as barley, while bulgur will have to be soaked in warm water for about 2-3 hours. If you want to use rice, it will have to be half-cooked otherwise it may become mushy. When you spread the phyllo sheets over the pan, they should form some wrinkles. This traps the air between the sheets and results in better baking of the pie and in a crunchier phyllo. And don’t be afraid if some sheets tear apart, it doesn’t matter! 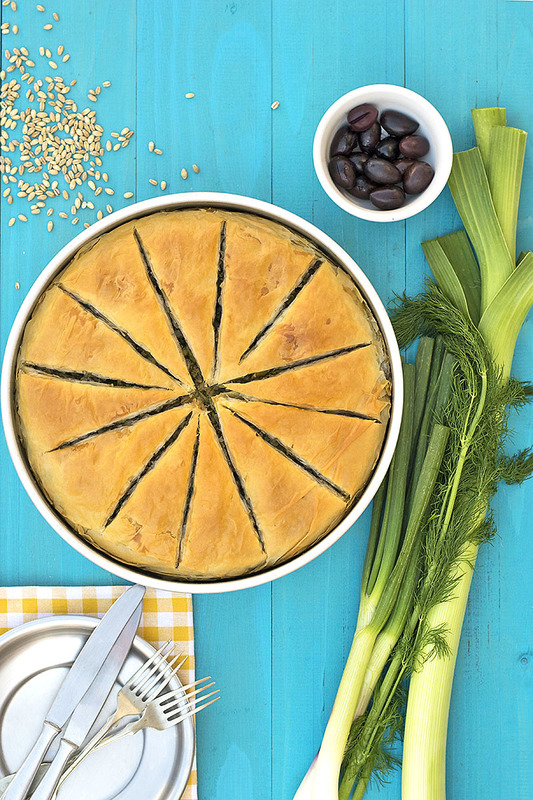 Instead of using ready-made phyllo, you can also try the crust recipe from this vegan savory pie with red bean puree and vegetables. For non-vegans: Add a cup of crumbled feta into the filling and this pie will be similar to spanakopita. Substitute wheat berries, bulgur, or rice for the barley. 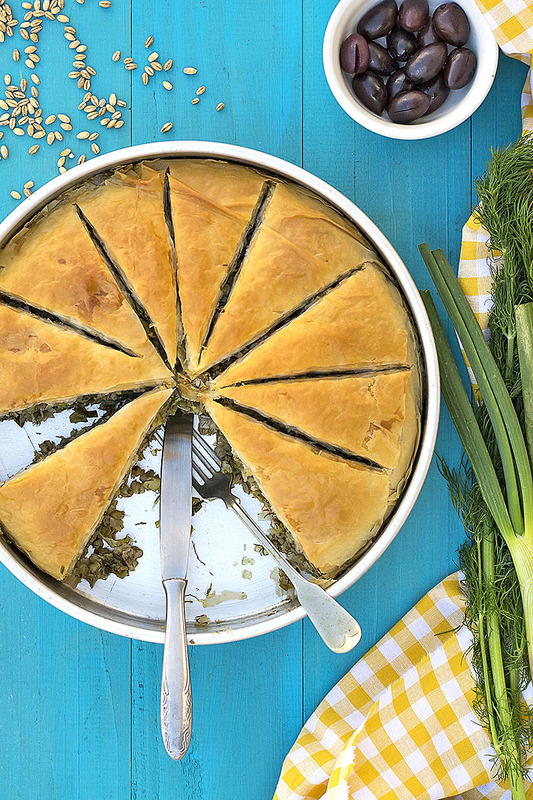 This healthy leek, fennel and barley pie can also be made with wheat berries or rice. It’s also so versatile that can be served as a lunch, side, or dinner. Soak the barley from the night before: transfer it to a large bowl and fill with water. Rinse well and boil with plenty of fresh water according to the directions of the package or until soft (you can add 1 vegetable bouillon to the pot for extra flavor). Pearl barley requires about 30 minutes while hulled barley needs 45 minutes to 1 hour. Drain and set aside. Transfer the olive oil, the onion and the leeks in a large pot or saucepan and heat over medium heat. Cook until soft and then add the barley and the wine. Stir until the wine is evaporated, remove from heat and add the parsley, nutmeg, lemon zest, salt, and pepper. Taste and if it seems bland add more salt. Lightly oil an 11-inch (28 cm) round pan and cover it with one sheet of phyllo. The sheet should overhang from the pan. Also, for the phyllo to trap some air, the sheet should be a bit wrinkly. Lightly brush the phyllo with some olive oil (not much) and cover with another sheet. Do this until you have used half of the sheets. Fill the pie with the filling and fold the overhanging sheets over it. Cover with the rest of the phyllo, brushing with a bit of olive oil each sheet. Trim the edges or tuck them between the pan and the pie. Score the surface and bake on the lower rack of the oven for 50-60 minutes or until golden brown. Serve warm or at room temperature. Eat! If you like this recipe, Pin it!